A state-of-the-art, dual treatment serum that reconstructs hair at its core, reversing visible damage from styling, coloring, harsh chemicals and over-processing. 33.6 ml ℮ / 1.14 fl. oz. To learn more about Inner Force Restructuring Serum, please contact your MONAT Market Partner. This innovative, high intensity dual chamber treatment serum moisturizes and nurtures the hair and scalp as it transforms the tresses. 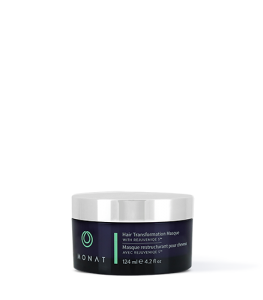 By penetrating deep into the hair cuticle, two NEW proprietary, state-of-the-art ingredient technologies exclusive to MONAT, FIBER RESCUE™ and REJUVENIQE S™, dramatically improve the look and feel of hair elasticity, rescuing damaged hair from the inside-out. INNER FORCE RESTRUCTURING SERUM works to rebuild, re-strengthen, restructure and re-surface, leaving each hair strand looking smoother, shinier, stronger, healthier and more beautiful. Targets deep levels of hair damage and surface hair erosion. Rebuilds the hair architecture from the inside out to correct and prevent damage. Restores hair fiber elasticity, resilience, structure and strength. Resurfaces the hair and improves its structure. Delivers essential hydration and nutrients to the hair cortex. Restores, seals, smooths, and protects the hair cuticle against friction and moisture loss. Provides UV protection to help prevent hair color fade. Protects against breakage during hair styling without weighing hair down. Hair looks healthier and stronger, with improved vitality, long-lasting beauty. Apply 1-2 pumps in the palm of the hand (depending on length of hair - use more if needed). Leave in, do not rinse.